Commissioned is a cooperative historical strategy board game that takes place during the first 150 years of the spread of Christianity throughout the Roman Empire. The object of the game varies by scenario, but usually consists of successfully establishing churches in a set of cities on the map board and collecting specific cards representing books of the New Testament. The game can be played with 2–6 players in about an hour. Not only does the use of cards combined with two difficulty levels make the game replayable, but also 5 different scenarios with different winning strategies ensure the game will keep your attention. When you first play Commissioned you may be tempted to compare it to Pandemic. Although Commissioned may have been inspired by Pandemic, it is not derivative. Movement and overall game play have a completely different feel. In Pandemic, you move around the board trying to stop the spread of diseases. In Commissioned, you don't have the freedom to move just anywhere you like and your goal is to spread your influence across the map. Commissioned player abilities are not inherent; they are represented by cards that have a higher chance of making it into a player's hand. Also, the way trial cards work in Commissioned is significantly different from the way infection cards work in Pandemic. Despite the differences, it's likely that you'll enjoy playing Commissioned if you enjoy playing Pandemic. I haven't had the opportunity to play Commissioned with my nieces yet, but I started playing Pandemic with them when they were 6 and 9 years old. I believe Commissioned is equally playable as a family game with children that young. I'm not going to explain all of the rules (that's what the rule book is for). Instead, I'm going to give a high-level picture of the basic game elements. Commissioned is played on a point-to-point map of the Roman Empire circa 20 A.D. (see Figure 1). Two maps are included. Four scenarios use board A and one scenario uses board B. Players start with a total of six apostles and missionaries. 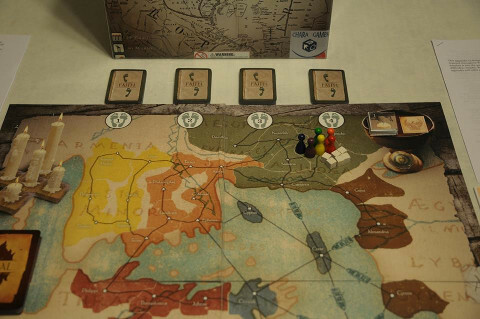 Apostles correspond to players and missionaries balance the game for less than six players, providing the apostle ability to make moves to empty board locations (called mission moves). With two players, you use four missionaries. With six players, you don't use any missionaries. Commissioned is played on a point-to-point map of the Roman Empire circa 20 A.D. This photograph shows the starting position for the Acts of the Apostles scenario with all of the apostles and initial church members in Jerusalem. Each player starts with a deck of 6 cards empowering an apostle's special ability (e.g., extra movement or adding a church member) plus 2 word cards. A word card (a 2 faith-point card) can be used to collect part of the New Testament or played for a special effect listed on the card. Depending on the number of players, you start with 5 or 6 cards from your deck. As the game progresses, you have the opportunity to buy faith cards from four separate decks (sorted by faith point values of 1–4). Deck-building is not the focus of the game, but remains an important strategic element that cannot be ignored. If players don't figure out how to get the right cards into their decks and then into their hands, they will lose every time. The heart of the game is the Live phase. First, you draw a trial card and apply its effect. Trial cards limit the length of the game. If you do not fulfill a scenario's victory conditions beore the trial deck runs out of cards, you lose. Trial cards represent the obstacles facing the Apostles and the Church in the years of persecution by the Roman authorities. Among other effects, a trial card may cause a church to lose members, force its members to scatter to adjoining locations, or even extinguish a church. A church is extinguished if it loses all of its population in a location. If that happens five times, you lose the game. After applying the effects of a trial card, players choose one or two cards from their hands (depending on the number of players) and place them face down on their apostle boards (see Figure 2 for a glimpse of the apostle boards). After everyone has chosen his cards, all of the cards are revealed simultaneously. The current player, called the Elder, then chooses two of those cards to use during the turn. A card may be played for its effect or, if it is a word card, may be used to collect New Testament books. 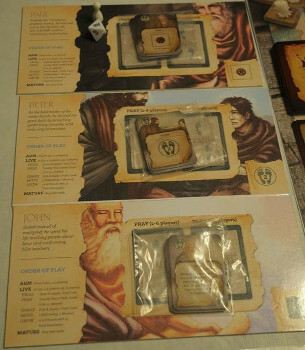 Player Apostle boards describe a player's special ability, list an abbreviated sequence of play, and contain spaces for a player's faith deck and revealed faith cards. After using the faith cards, the Elder may make two moves (more if a card effect granted bonus moves). The Elder may move any piece on the board, including other players' apostle pieces. This aspect of the game is quite different from other cooperative games where players only ever move their own pieces. In order to understand movement, you must first understand the concept of a church. A church is a location on the board—either a city or a ship—that contains at least one church member, missionary, or apostle. You may move as many pieces as you like from one church to an ajdoining church. This is called a fellowship move. You must be careful not to move all of the pieces from one church to another or else the church will be extinguished (the one exception is when moving pieces from a ship to a city). Another type of move, called a mission move, allows you to move pieces from a church to an empty location as long as they are accompanied by at least one apostle or missionary. Mission moves can be made only from churches containing at least 4 pieces (at least one scenario increases that requirement). Therefore, a key aspect of the game is adding members to churches via cards and the grow step to enable mission moves. The board presents a bit of a travelling salesman problem, requiring you to determine how to traverse the cities you must reach before the trial deck runs out. Also, you must anticipate the possibility of certain trial cards being drawn and prepare to deal with them. Among other hazards, trial cards may place mission stops or growth stops that prevent you from performing mission moves from or adding church members to a location. Commissioned includes 5 scenarios that emphasize different strategic aspects of the game. The longer scenarios, such as Acts of the Apostle, reward different strategies at different points in the game. The variety of scenarios provides multiple play experiences, almost giving you five games for the price of one. The first scenario, Acts of the Apostles, starts with all apostles and missionaries, plus six church members, in Jerusalem (see Figure 1). The object of the scenario is to establish a church in every city on the board and collect all nine word cards corresponding to different parts of the New Testament. 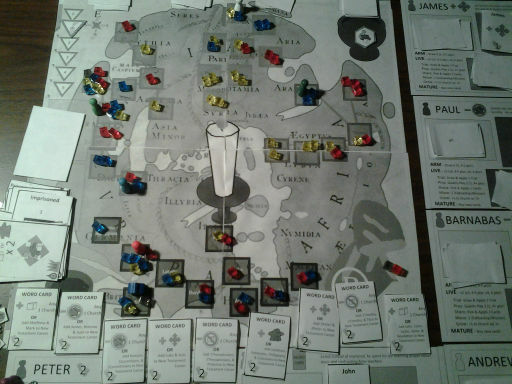 End of a poorly-played Acts of the Apostles scenario using playtest components. The game was lost by early drawing of devastating trial cards, not collecting New Testament books soon enough, and neglecting to plan church growth effectively to set up use of extra move cards to expand via mission moves toward the end of the game. Even though all aspects of the game are important in this scenario, you cannot escape the fact that there are 35 cities on the board and 18-21 Trial cards (depending on the number of players). You only get two moves per trial card and you're not going to be able to mission move every turn, so getting extra moves via 3-Faith +2 Move cards and/or +1 with James becomes important later in the game. You have to collect New Testament books before you really need to use extra moves. The limited time to move to all locations forces you to consider the travelling salesman problem, especially after you've been scattered and have to spend moves to get back on track. Also, there are only 75 church members, ensuring you can only afford to leave at most two church members in most locations, except for the periphery from which you'll be staging your mission moves. The second scenario, Peter's Gentile Outreach, is played on a small part of the board and requires you to establish churches with at least 10 members throughout that part of the board. The scenario starts with a number of growth and mission stops on the board. Also, growth and mission moves are more expensive. Movement cards aren't very important in this scenario. Growth trumps everything and fellowship moves figure prominently once you've spread out. You don't even have to remove all of the stops as long as you can move into a location. Trial cards can be punishing because the entire scenario is confined to one region, ensuring regional effects will have maximal impact. At the same time, depending on when it happens, scattering can save you a mission move (or having to remove a mission stop). The third scenario, The First Missionary Journeys, uses just under half the board, making it potentially shorter than Acts of the Apostles. This scenario starts with a lot of growth and mission stops on the board. Trying to remove all of the stops via card play can waste time. You may want to consider removing only the stops that block your initial advance and collecting all 9 books (even though it's not required to fulfill the victory conditions) to remove all stops. 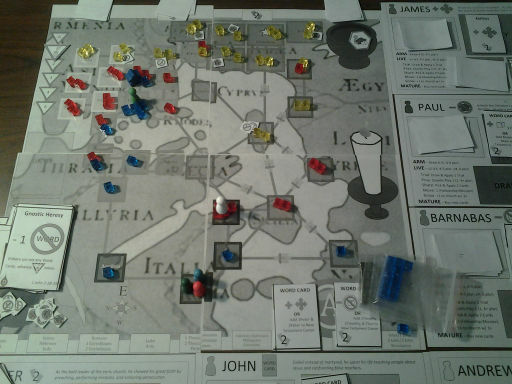 End of The First Missionary Journeys scenario using playtest components. All nine New Testament word cards were collected in order to remove all of the growth and mission stops from the start of the scenario. The fourth scenario, Appeal to Caesar, is perhaps the most interesting because it has a very different victory condition than the other scenarios. You must move Paul to Rome via a specified route and play a specific faith card in Rome. 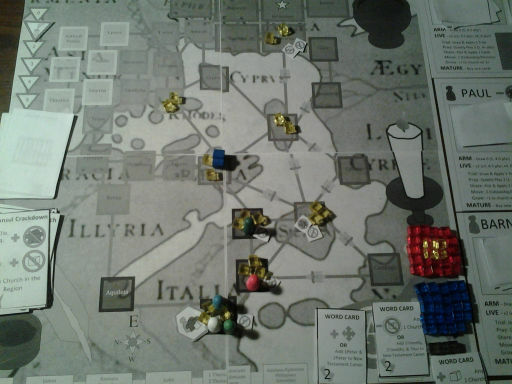 End of Appeal to Caesar scenario using playtest components. The church at Cyrene was extinguished, but not required for victory. With greater numbers of players, extra moves are important to advance Paul in time. For example, with 6 players, you'll only have 3 chances to move Paul; yet, Paul must make 3 expensive ship moves. Buying 4-Faith cards is more important than ever because you need Convert City Leaders. You may even need Carried off by Spirit to get Paul to Rome. The fifth scenario, To the Ends of the Earth, takes place on board B, which covers a larger geographic area and does not contain any ships. The apostles start off in separate unconnected regions. Therefore, you're spared the rush to spread out your apostles to mitigate the effects of regional trial cards. You can plan your use of growth and movement effectively from the start, knowing you have to prepare the next apostle's region to weather the effects of a Trial card on the next turn. Extra moves are important because more backtracking is necessary than on Board A, even when you dedicate two apostles/missionaries each to the green and black regions (which you should do, since they each have 10 cities as compared to 6 and 7 in the blue and red regions). You must be careful not to accumulate too many church members in any one region so as to consume the entire supply before the end of the game, preventing another region from growing the final church members it needs. 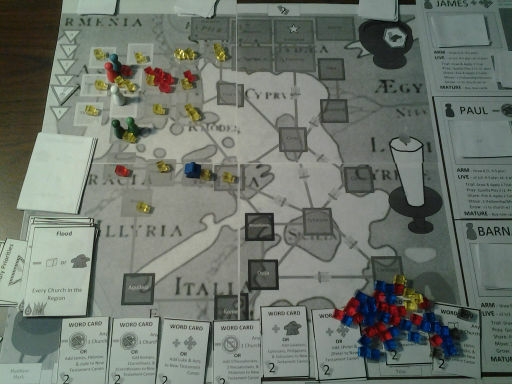 End of To the Ends of the Earth scenario using playtest components. This was a close game that ended with one card left in the trial deck! The grow step occurs after movement, giving you the option to add one member to each church containing at least 3 pieces. Moving to a city via a ship requires two moves. First you must move to the ship, then you must move to the city.